Abstract: The 9th edition of the gold standard in pediatric cardiology offers up-to-date, comprehensive coverage of this challenging and rapidly changing field. 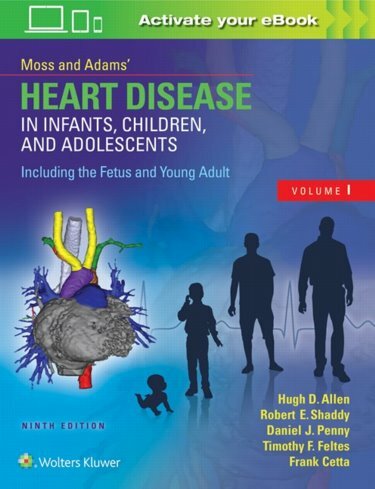 New chapters based on reader requests, two new associate editors, new contributing authors, and an enhanced digital version of the text make Moss and Adams' Heart Disease in Infants, Children, and Adolescents the reference you'll turn to when caring for patients. From cover to cover, this award-winning two-volume resource provides the authoritative, state-of-the-art information you need when caring for young patients with heart disease. New, reader-requested chapters cover Development of Myocardial Structure and Function, Global Challenge of Heart Disease, Impact of Congenital Heart Disease on Other Organ Systems, Non-Compaction Cardiomyopathy, Beyond the Cardiac Device, and Transition to Adult Care. All chapters have been updated and revised, including vital new information on genetics and embryo development. Two new associate editors, Drs. Daniel J. Penny and Frank Cetta, offer fresh perspectives in their areas of expertise. 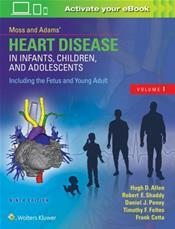 Enhanced digital access includes the full text; bonus question and answer sections similar to those on the pediatric cardiology board examination; videos of echoes, angiograms, aortic arch anomalies, open-heart operations, and more; and phonocardiograms with accompanying audio of various heart sounds and murmurs.